In the latest Heritage Magazine (Issue 151 Summer 2018 ), is an article by Kennedy Warne entitled "The Taniwha's backscratcher". The Taniwha in the article is Ureia - the Hauraki's Taniwha. Stories about Ureia abound, including the story that the taniwha escorted the Tainui waka when it arrived and anchored at Te Anaputu, a rocky outcrop north of Tararu, Thames Coast. On the right is "This carving of the taniwha Ureia is in the Hotonui meeting house, formerly at Thames but now in the Auckland War Memorial Museum. 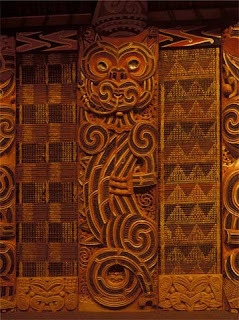 Ureia was a powerful taniwha living at Tīkapa (Firth of Thames). The taniwha is in the marakihau style – with a serpent-like body and hollow tongue." 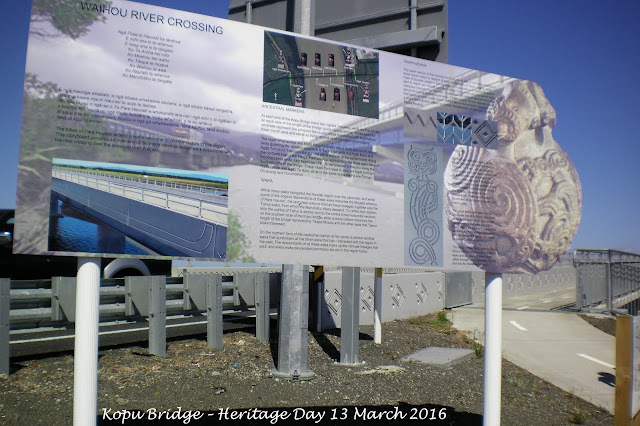 The 'new' Kopu Bridge also includes an etching of the taniwha Ureia on the piles. The essence of a taniwha is explained in Warne's article and explained that taniwha's can be seen as 'kaitiaki' "a deep concept that is approximated by ideas of guardianship and stewardship of the natural world. Death of Ureia. Newspaper article 1927 and another in 1931. Te Anaputa-o-Tainui. The name today is Tainui Cove, 6km north of Thames. It remained a place of shelter for centuries, but has mostly been destroyed following the goldmining and widening of the road. Further reading page 151-152 Te Takoto o te Whenua o Hauraki by T Turoa and Te A C Royal. Description of Ureia. The above book also has an appendix on Hauraki Taniwha and Tupua. Said to be a giant reptile that was said to be lured away from the Waikato River by a Hauraki tribe. At the entrance of the Hauraki Gulf, Ureia assumed the shape of a dolphin and guided the Tainui canoe and people to safety. Famed for his deeds, the Hauraki tribe are said to have become the envy of their neighbours, which later contributed to the 'death' of the legendary taniwha. A descriptive board at the east end of the Kopu Bridge features information on the Taniwha known as Ureia.